With nearly 40% of Saudi Arabia’s population under the age of 14, analysts have long been warning that the country’s biggest challenge lies in opening up new career paths for its younger generations. Spotting an opportunity, 22-year-old Maria Mahdaly and a group of fellow Saudi Arabian women launched Rumman Company in 2007, a firm that now fosters young entrepreneurs. One of its own businesses is a social media website for Saudi youth, called Fainak.com, which means, "Where are you?" in Arabic. Now boasting roughly 30,000 subscribers in the Kingdom, it has also become an advertising platform and a local events organizer. 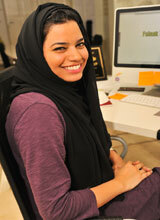 Rumman’s other business is Destination Jeddah, an events and lifestyle magazine. Coming from a family that embraces female entrepreneurs — her mother was one of the first to open a women’s fashion shop in Jeddah — Mahdaly says she is lucky to have grown up in the household that she did. But she has also relied on her understanding of Saudi culture to ensure Rumman’s social media site and other ventures respect sensitivities and gain local support, something that is critical in a conservative society in which Facebook has been denounced by vocal clerics as misleading youth. In an interview with Arabic Knowledge@Wharton at the recent Middle East North Africa ICT Forum in Amman, Jordan, Mahdaly talked about the challenges female entrepreneurs have overcome in Saudi Arabia, the successes and missteps she has learned from while running a business, and being a role model for other young entrepreneurs. Arabic Knowledge@Wharton: Tell us about your business projects. Maria Mahdaly: When I started, I was 19, and one of the things I found was that there was no platform supporting young people in Saudi Arabia. There was nothing that guides them and tells them, "This is what you do with your talents, and this is how you do it." So we created Rumman Company as the parent company with two ventures. One is Destination Jeddah magazine, which is kind of like the Time Out of Jeddah, and the other is Fainak.com. The youth make up more than half the population in Saudi Arabia, so this is what we can do for them. Arabic Knowledge@Wharton: How did you figure out the business model? What kind of support did you have? Mahdaly: When we started the company, we were working from home. We didn’t sleep. We were in the living room working day and night. We talked to a lot of our friends and they helped us understand what the business plan needed. Once our ideas and vision were clear, we approached investors, and right away one accepted. We had an investor for four months, but then we started making our own money and we put it back into the business. Soon enough, we could sustain ourselves. Arabic Knowledge@Wharton: As a local entrepreneur, did you receive support from the Saudi government? Mahdaly: There’s definitely been more support for start-ups here. The week of November 21, for example, is [a national] entrepreneurship week. For the first time, even government sectors are [holding] workshops to build skills. Also, two years ago, a fund was established for start-ups. When we started, there was nothing to help us. A lot of individuals recognized the importance of entrepreneurship, and because of that, a lot of government-sponsored initiatives have sprung up. Arabic Knowledge@Wharton: What’s the motivation for young people to do something innovative in Saudi Arabia, where many come from privileged backgrounds? Mahdaly: Young people in Saudi Arabia are not just well off. They are also open to the world. They travel, they’ve seen a lot. They see a lot of changes happening around the world. They have started thinking that they want to part of the change and do something for their country. That’s why Saudi Arabia is one of the most innovative places in the Middle East. There are young people all over the country starting businesses and being innovative. Arabic Knowledge@Wharton: Your venture is run entirely by women. Is that easy? Mahdaly: I always say that being an entrepreneur is not easy for either a man or a woman. But it definitely has its ups and downs if you are female. There are a lot of limitations, a lot of things that you need men to do for you. For example, with legal work, you have to have a man represent you. We did have a couple of obstacles, but now in Saudi Arabia, you feel a huge amount of support for women. That is because a couple of women took the steps to become leaders and put out the challenge: We can do something great, so why aren’t you supporting us? The culture is accepting it; the government is accepting it. King Abdullah bin Abdul-Aziz is a huge supporter of women nowadays. It’s definitely getting better. Arabic Knowledge@Wharton: How is Saudi Arabia changing its perspective on women being in the workplace? Mahdaly: The most important change is in accepting women in leadership roles. Women in the past few years in Saudi Arabia have showed they can take leadership roles and be successful. People have accepted that they can have women in the workforce and as leaders. We have men working with us in the office. When we started the company, we felt men wouldn’t accept a female boss: They wouldn’t accept tasks from, or listen to, a woman who has authority. But the culture has changed a lot in the past three years. I don’t think we face that problem now. Since there are a lot of female entrepreneurs and women who are leaders now, men aren’t as intimidated. Arabic Knowledge@Wharton: What’s been your biggest success, and how are you trying to improve that? Mahdaly: The biggest success is the impact we are having on our young people. A lot of Saudi youth have joined us, even on a part-time basis. We’ve built up character in these young people. Now, 60% of the youth who joined us have started a company or initiative [of their own]. For example, one started a production house, and another an event management company. Seeing young people using their experience with us to start their own businesses is the main success. When we started to invest in young people, we did it out of passion and goodwill, but now we want to do it in a sustainable way. We want to do it in a way that gives them strong experience before they graduate, which they can take to the professional world. Arabic Knowledge@Wharton: What’s the biggest misstep so far, and how did you learn from it? Mahdaly: Our biggest challenge was with Fainak.com. We were very successful in the first six months. We didn’t expect so many people to join us and be part of the company. We weren’t ready for it. We didn’t have enough people working in the office. We didn’t know how to control everything, and it was getting chaotic. We paused to examine the structure of the company and started figuring how to control everything. The organization of the core of the company was key. Now, we are very stable and gradually reaching our goals. Arabic Knowledge@Wharton: How did Fainak.com achieve its growth? Mahdaly: There is no other platform specifically targeting young people in Saudi Arabia. In our first event, we said, "What we do is we support you guys." Someone stood up and said, "What kind of things can you do for us?" I asked, "What do you have?" He said he was studying finance but produces movies as a hobby. I said, "Let’s put you in contact with our people." We guided him and got him training. Now, he owns his own production house, and he hasn’t even graduated from school yet. As soon as we did that, a lot of people started to trust us. We work in a fun and innovative way. It’s not, "Come to the office and we’ll interview you." It’s very fun and entertaining, but there always is a message behind it. Arabic Knowledge@Wharton: Fun and entertaining in what way? Mahdaly: We do a lot of social work. We encourage young people to give back to the community. For example, we started a car wash campaign to help the poor. Usually when you think of a car wash, you think of girls washing cars and guys walking around. We had a lot of volunteers, and a lot of guys came. Within three hours, we had reached double the target we had set. Arabic Knowledge@Wharton: But your company is not solely philanthropic? Mahdaly: We call ourselves a for-profit social enterprise. Our impact is not only social; we also have a financial impact. We have the only platform for young people in Saudi Arabia, so a lot of businesses and brands tell us that they want to reach this target audience and be a part of our brand. We connect companies with the target audience in a way that [the brands] can invest in [youth]. For example, most companies are trying to engage young people through something they can benefit from. We get a young person, who has an idea that the company can support and be part of. Or, if an company wants to do an event, we can create a program. We create an event and a social media campaign, which reaches the target audience in a way that benefits them as well. Arabic Knowledge@Wharton: What effect is social media having on Saudi Arabian society? Mahdaly: Social media is a whole Internet culture. We are connecting with others in a way that wasn’t possible before. People are just getting into it. They started to notice how important conversation is online. They can express their opinions and thoughts, without the boundaries of a physical meeting. With any new idea, such as social media, there are supporters and opponents. The important thing when starting something is to make sure it’s compatible with your culture. Respect all people, including the religious groups. I’m not promoting or doing anything out of [line with] the culture. That’s why we haven’t had any problems. Arabic Knowledge@Wharton: You’re now traveling to events to speak about entrepreneurship. Is it overwhelming? Mahdaly: It is overwhelming. I still don’t get it. I’m like, "I’m getting invited to this conference, wow…." I don’t see the impact I’m making. Sometimes I meet someone who says, "You are my role model. Can I learn from you? Can I be an intern?" These things usually shock me. I would have loved to have met people when I was starting out and been around them while they worked. I always give them a chance and treat them the way I would have wanted to be treated when I was starting out. Arabic Knowledge@Wharton: Do you have a role model? Mahdaly: My only role model is my mother. She started being her own boss a long time ago, and I’ve seen her struggle through the experience. When I was young, she started a retail shop, one of the first retail shops in Saudi Arabia. She was selling women’s fashion. It was difficult from a cultural point of view. People didn’t get that a woman could start her own company. They would ask her if her husband was running the store, and she would have to explain that this was her project alone. I’m lucky to be in a family that accepts entrepreneurship. Arabic Knowledge@Wharton: What would you say to young entrepreneurs looking to start a business? Mahdaly: Be innovative and never try to create something that already exists. Look at best practices and see if you can do something better. Don’t just create another Facebook or Twitter…. Also, getting investments can be difficult. So, try to build your concept and what you want to do. Show your passion. I’ve always believed that doing something you love makes you successful. Once you find that, you’ll be able to reach the goals you set out for yourself.